After long weeks sat at home berating the foot and mouth situation, the walkscotland.com team was becoming a little cabin crazy. A jaunt to the rugged Isle of Rum proved irresistible, and although a traverse of the Rum Cuillin proved truly murderous on unconditioned legs and lungs, the appetite was well and truly whetted. An easy leg-stretcher on the Pap of Glencoe the following day only had us longing for more adventure and so it was with spirits high that we left for the Arrochar Alps that day in early May. From the Forestry Commission campsite at Ardgartan, the 2900 foot Cobbler (or Ben Arthur to give it its other name) is easily identifiable. The lumpy, jagged summit ridge throws down such a gauntlet that an estimated 100,000 people huff and puff up its slopes every year, which surely makes it the most popular Corbett in the country. We shunned the traditional ascent from Succoth by taking the gravel path from the campsite along the riverbank towards the visitor centre (marked on the OS map as an information point). About half a kilometre along this path cross the A83 trunk road at a point where two white wooden poles mark the start of the climb. 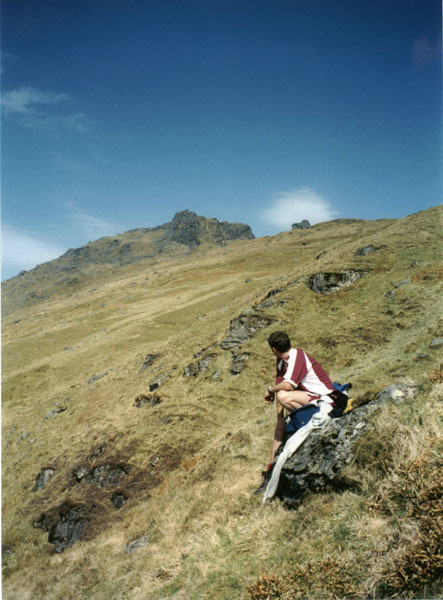 A signpost here directs walkers towards the Cobbler and its neighbouring peaks. Further information indicated that while our first destination and Beinn Narnain were open to walkers, Beinn Ime and Ben Vane were still out of bounds due to foot and mouth. The muddy path strikes up the hillside, gently at first, then more steeply as you brush past an evergreen plantation before crossing a broad Land Rover track. Higher up the track becomes even more broken and soggy as you cut through a break in some young conifers. It was here that we met our first fellow walker, resting on a large stone as he wiped the perspiration from his brow. We had put our faith in the weather prediction and were travelling fast and light. He, on the other hand, was probably feeling a bit overdressed in the scorching conditions. Clamber up steepening grassy slopes in a northerly direction to reach an obvious shoulder which tops out at around 550 metres, giving an excellent view down Loch Long, said to the deepest in Scotland. We later learned, while propping up Callum's Bar in Arrochar at the head of the loch, that submariners used to fire dummy torpedoes up the waterway with only a net to stop them zipping up the beach! Head north west along a path towards the fearsome-looking south top of the Cobbler. 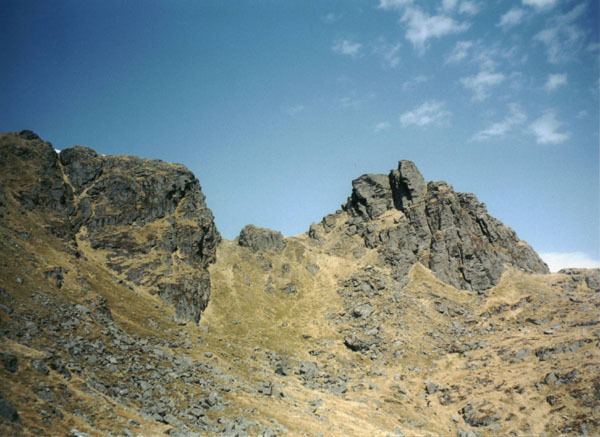 During the ascent each of the Cobbler's three tops seem to present themselves as the highest but it is only the middle one you have to bag if you want to reach the true summit. 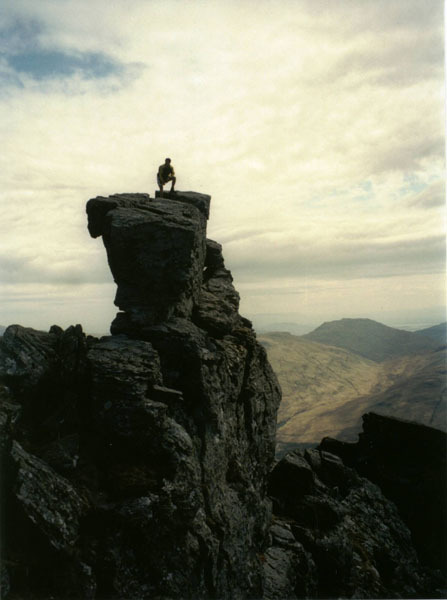 Having re-ignited a taste for scrambling on the Rum Cuillin, I was determined to carry out a full traverse of the entire ridge which is given a grade five rating in Ralph Storer's route guide book. Approaching the foot of the pyramidal south top, it soon became clear that Colin's dog wasn't going to make this particular climb. He may bark (and he does...all the time!) but he's not barking mad. Colin didn't show too much disappointment at having to accompany his pooch around the obstacle and left me to clamber up for a picture at the summit. A word of caution here. This route is graded five for a very good reason and if you are even the least bit unsure of your abilities then do the smart thing and walk round. The first test involves a clamber over a large boulder which can be accomplished by wedging your left foot in a small crevice and throwing your right leg up and over. The route climbs almost vertically over a stepped grassy wall before you get a stomach-churning dose of exposure as, face pressed hard against the stone, you are forced to inch right over a slender outcrop which affords a dizzying look straight down into the bowels of the corrie. I had to pause for thought before entering what appears to be a bottomless cave which requires a large stretch of the leg to step through and out the other side. The next step involves a shimmy up a narrow chimney but the holds are plentiful and good, although a slip here would have extremely dire consequences. From here it is a relatively straightforward scramble to the summit marked out by the proliferation of gouge marks caused by crampon-equipped climbers. The route off the top north is blind because it is so steep and it is probably easier to attempt a north to south traverse. I attempted to retrace my steps back down but misjudged the descent route and was left stuck. After the initial fright I composed myself and found the chimney which I managed to inch down and back to the crevasse. With hindsight this would have been a much more enjoyable experience with a mate and a rope but by the time I joined my colleague I was fairly high on adrenalin. The path winds its way round to the main middle summit where another test of nerve is required. Approaching the strange bouldery spire from the north, you have to thread yourself through a rock window known locally as Argyll's Eyeglass. Once though you must walk along a fairly narrow ledge which hangs over a big vertical drop before turning back on yourself and clambering up onto the top boulder. Simply retrace your steps to back to gain the summit ridge. From here an ascent of the north top is simplicity in itself and we scampered up to the summit cairn in an unusual (for us) display of energy and exuberance. The Cobbler well and truly nailed, we set off down towards the col between it and the 3036 foot Beinn Narnain. We had considered ending the day by following the Allt a Bhalachain down past the Narnain boulders and back to the road but decided to continue the adventure by adding the Munro to our card. The ascent of Narnain is straightforward enough even if the paths come and go as you pass through small boulder fields. 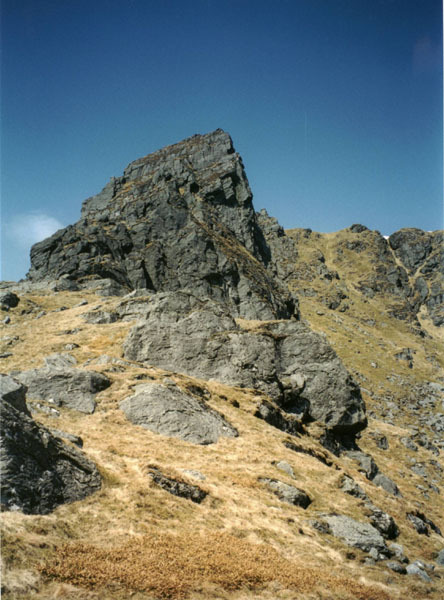 Steep slopes rise to the stony summit of Narnain where a cairn then a stone-built trig point mark the zenith which sits above a climbers' crag known as Spearhead Buttress. Meeting another couple on top of the Munro, we quickly decided to continue on to the hill's eastern outlier, A' Chrois, to make a worthy triple mountain day. Despite reaching 2786 feet, this hill misses out on the criteria to be included in any tick list and, surrounded as it is by Munros, is always going to be a lonely place. The route north eastwards picks up a narrow path which takes an enjoyable undulating line round the little rocky knolls of Creag Tharsuinn before topping out at a tussocky summit. To descend take a southerly then south easterly line over steep grass slopes before picking up the Allt Sugach. Keeping the burn to your right, follow its course down the glen to a fenced wood. the path drops down beside the fence and into a gorge where the burn cascades into numerous little pools. With the sun beating down relentlessly, we couldn't resist visiting one of these pools to soothe our steaming feet! The path crosses a style and into the woods before intercepting the main forestry track. Go right and follow the track which eventually passes a telephone tower. You can either descend to the road at a point adjacent to the pier on Loch Long or continue round to emerge at Argdartan. Map OS Landranger sheet 56. Start/parking Ardgartan on the A83 just north west of the campsite. GR: NN 271036. Grading While the main summit ridge of The Cobbler is easily attainable, the south and centre tops are very exposed, require scrambling and a good head for heights. The south top in particular can, and should, be avoided unless you are competent at climbing and accompanied by an accomplice for safety. 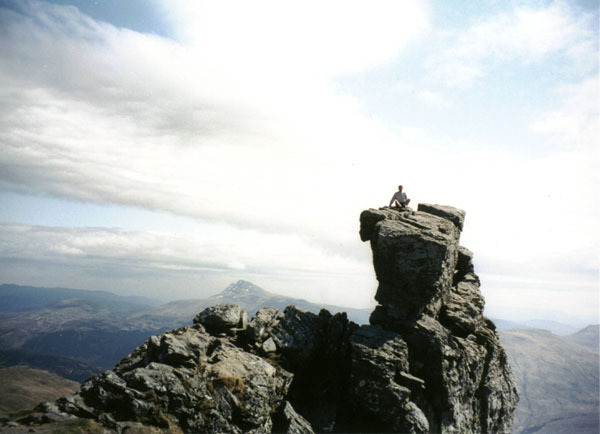 Beinn Narnain and A'Chrois provide no particular difficulties but route-finding in adverse weather will be a consideration given the proximity of steep crags.